Quartz crystal of the amethyst variety: woo! The ability to crack into smaller shapes similar to their original shape. The ability to conduct light, depending on how pure the crystal is. Pure crystals [note 2] can absorb energy from the Sun which can then be used for healing purposes powering medical devices. The ability to grow by capturing material of the same chemical composition from a nearby, usually saturated, solution. 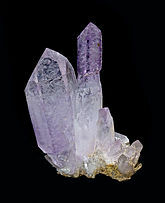 Some, such as quartz, have the ability to vibrate at a specific frequency when electrical energy is applied (the technique that regulates quartz watches, among other oscillator-dependent devices). Certain crystals have the ability to generate electricity when stress is applied to them (the piezoelectric effect). In crystals such as ruby, the ability to amplify light for a laser by exciting atoms into a higher quantum state. Crystals can be grown on a piece of string hanging in a saturated solution of, for instance, epsom salts. To the overstressed and impressionable, these crystals might resemble a stalactite and be interpreted as refutation of the age of the Earth. (With Iceland Spar) The ability to split time and space into two initially identical yet divergent paths, or at least look like it. Holding the sum knowledge of the planet Krypton (usually in the form of a sliver of purified silicon crystal, with a forest of imperfections, also known as transistors, etched onto the surface). If you haven't noticed, inducing otherwise "sensible" people to believe in crystal woo. Crystals are also important in x-ray crystallography. As only a tiny fraction of X-rays are diffracted by a single molecule, many molecules are needed to produce a readable signal. The high, regular order of crystals means that many identical units — as opposed to a completely amorphous solid or solution which would create a randomized result — can be used to diffract X-rays, producing a pattern that can be used to identify the compound's structure, often referred to as the "crystal structure." This technique was used on partially-crystallised DNA by Rosalind Franklin to generate the X-ray diffraction data needed for Francis Crick and James Watson to determine the molecule's helical structure. Most igneous rocks (rocks which cooled from magma) are made out of crystals of varying sizes; a rock which cooled fast will have loads of microscopic crystals (unless it cools so fast that it becomes a glass, which means it has no crystals at all), while a rock which cooled really slowly will have a comparatively small number of lovely big crystals. Igneous geologists love rocks which contain big pure crystals because geological theories and formulae work beautifully when applied to big pure crystals, but applying them to the microscopic crystals just breaks everything. It's kind of like how physicists love hydrogen because it's the only element simple enough to not require numerical approximations when solving for the atomic orbitals. Metamorphic and sedimentary geologists are used to seeing crystals either heavily distorted or smashed into little tiny bits anyway, so they don't particularly care about crystals, except for their aesthetic value. Ironically, despite the claims of protection, quartz crystals are a known human carcinogen, based on worker inhalation of crystalline silica in the form of quartz. Crystal meth is "the baaad stuff." Crystal is a (not very) common name among human females. Crystal, or lead crystal, is a form of fine glassware. Crystal is a fictional character in the Marvel Comics' universe. ↑ That's a technical term. ↑ In the pharmaceutical industry, a good yield is any number above 0. ↑ Thomas Pynchon. What, you mean that you haven't read him? ↑ Silica Dust, Crystalline, in the form of Quartz or Cristobalite (International Agency for Research on Cancer, volume 100C). This page was last modified on 20 September 2018, at 19:23.